PetFarmChallengeHelper is a small solution to show market values of dropped BOP pets in LootAppraiser based on the selected Trade Skill Master price source. It allows Pet Farm Challenges using LootApraiser_Challenge. It detects dropped BOP pets and converts the item IDs to those of caged pets which have a real item value. No configuration needed, just install it and pet values will show up in LA/LAC. Some 780 pet items are currently recognized (up to 8.1). PetFarmChallengeHelper requires LootAppraiser and TradeSkillMaster v3 and has support for LootAppraiser_Challenge. Not required but highly suggested are the additional addons TradeSkillMaster_AuctionDB, TradeSkillMaster_AppHelper and a working TSM Desktop App. 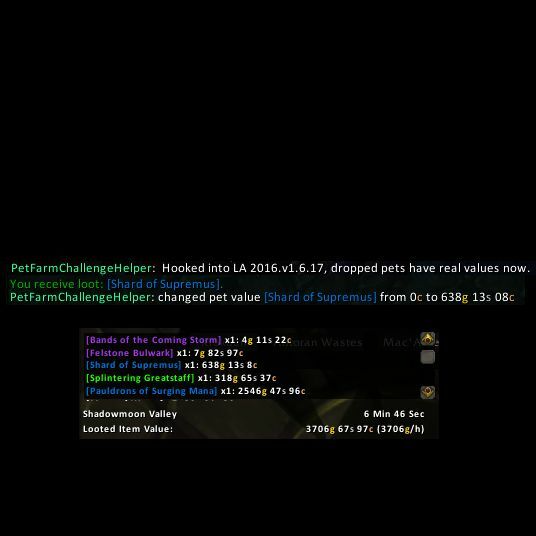 With TSM4 PetFarmChallengeHelper isn't needed anymore. Please report any bugs you may find or any suggestions you might have to the CurseForge Project Page. If you wish, you can send me a PM to Caraxe on Curse or to Expelliarmuuuuus on Twitch.